Colors are the life of the world. Colors add joy and so does our colored Blooming Combo. 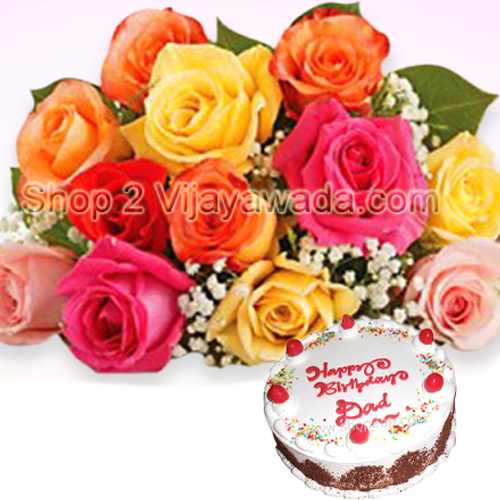 Our Blooming Combo is a lively combination of 12 mixed roses bunch and 1kg black forest cake. Our florist has tastefully decorated the beautiful flower basket and has used greenery and fillers to add to its charm. The charming combination of the multi colored floral bouquet and the rich cake is a wonderful gift for any occasion. Send the Blooming Combo at Baby Showers, as Thank You gifts and at other special occasions.Send flowers online and let your dear ones know how special they are.